Peptide (C)EQLTKETEGGNHS, corresponding to amino acid residues 215-227 of rat CaV1.3 (Accession P27732). 2nd extracellular loop, repeat I.
Homology Mouse, human - identical. Antibody concentration after reconstitution 0.9 mg/ml. 1-3. Anti-CaV1.3 (CACNA1D) (extracellular) Antibody (#ACC-311), (1:200). 4-6. Anti-CaV1.3 (CACNA1D) (extracellular) Antibody, preincubated with the control peptide antigen. Immunohistochemical staining of adult rat dorsal root ganglion (DRG) using Anti-CaV1.3 (CACNA1D) (extracellular) Antibody (#ACC-311). A. CaV1.3 labeling (red) appears in the cell bodies of the DRG. B. Nuclear staining using DAPI as the counterstain. C. Merged image of A and B. Cell surface detection of CaV1.3 in intact living rat pheochromocytoma (PC12) cells. 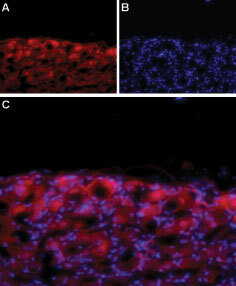 A. Extracellular staining of cells using Anti-CaV1.3 (CACNA1D) (extracellular) Antibody (#ACC-311), (1:50), (red). B. Merge of A with the live view of the cell. Catterall, W.A. et al. (2003) Pharmacol. Rev. 55, 579. Mangoni, M.E. et al. (2003) Proc. Natl. Acad. Sci. U.S.A. 100, 5543. Zhang, Z. et al. (2005) Circulation 112, 1936. Several peptidyl toxins have been described that are specific L-type channel blockers. These include the Mamba toxins Calcicludine (#SPC-650), Calciseptine (#C-500) and FS-2 (#F-700). So far no selective blocker for one of the CaV1 isoforms has been described. Alomone Labs is pleased to offer a highly specific antibody directed against an extracellular epitope of the rat protein. Anti-CaV1.3 (CACNA1D) (extracellular) Antibody (#ACC-311) can be used in western blot and immunohistochemistry and live cell imaging applications. It is specially suited to detect CaV1.3 channel in live cells. It has been designed to recognize CaV1.3 from mouse, rat and human samples. This antibody recognizes a different epitope and thus can also be used as a control for detecting CaV1.3.